Donald Trump has been elected to be our next president, and there are probably a million thoughts running through your head right now. You might be feeling stressed out, or sad. You might feel slightly nauseous at the uncertainty that seems to stretch ahead. You might also be looking for an outlet to express these thoughts and feelings — and finding a Donald Trump protest near you is one way to peacefully do exactly that. Trump has proven to be a divisive and controversial choice for president since the moment he started his bid for the White House. And, when the candidate took to the stage during election night to celebrate a win that had at one point seemed not only improbable, but unfathomable, tension reached an all-time high. But while there isn't much we can do to change the fact that Trump is now our president-elect, that doesn't mean we have to just sit idly back and accept what's happening. Now, more than ever, it is important to speak up and let the world know — let Trump know — that you will not stand behind a leader who repeatedly makes it clear he has no respect for marginalized Americans who have been working ceaselessly to secure the equality they deserve. While it is absolutely OK to be feeling upset or alone, know that you're not helpless. 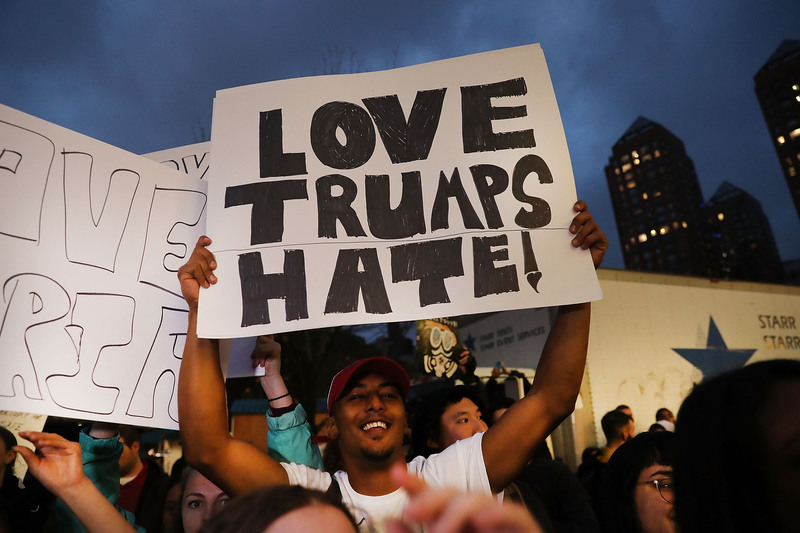 Here's how to find a Donald Trump protest in your area so that you can make yourself heard. As a social media-savvy Millennial, this may seem like the most obvious route, but it's also extremely effective. Simply type "Donald Trump protest" into the Facebook search bar, click "Events," and instantly find dozens of options available in your area. I'd also recommend looking under "Groups" and "Pages" as well. While these pages may not be made specifically for protests, the people who join them can often be good resources to helping you find what you're looking for. Looking for something in real time? Search Twitter to see what's going on around you. To get even more location-specific tweets, make sure you narrow your search results so that you're looking only at tweets posted near you. To do this, after you've entered key terms into your search bar, click "more options," and then "advanced search". Once you're in advanced search, you can easily switch up your location. You don't have to stand outside with groups of people and carry a sign to make your dissatisfaction known. You can simply sign online. In fact, if you've seen people posting black photos on Instagram, or replacing their profile pictures with black squares on social media sites, it's because they're doing just that. While it's not clear how this social media protest started, its message is clear — if you see someone boasting a black square anywhere on their profile, it's because they are voicing their support against Donald Trump. No matter which route you choose to go, just please be respectful of others. The idea is to voice your dissatisfaction and inspire change — not to spread hate of any kind. Now, more than ever, we need to stand together.